Kent – also known as the Garden of England – is famous for its abundance of produce and mild climate. But Kent has more than apples, cherries and hops. If you’re thinking of visiting Kent, you can expect historic towns, sandy beaches, ancient castles and everything in between – you really can chose the pace of your break. There is no better way to experience this exceptional county than by staying in a country bed and breakfast, a self-catering cottage, or on a working farm. And if you like the idea of really getting close to the countryside (while still retaining those essential creature comforts) why not try glamping? 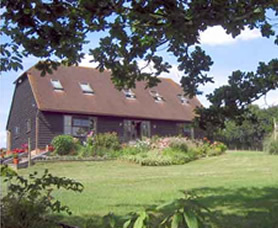 Farm Stay Kent are an alliance of holiday lets, B&Bs and campsites linked by the ethos of providing a rural or semi-rural retreat for those seeking a holiday or short break away from the bustle of their everyday lives. Rural certainly doesn’t mean basic, and all Farm Stay members must meet strict criteria as well as fulfil essential health and safety requirements. Many are equipped with Wi-Fi and en-suite facilities for your comfort and convenience, while easy access to the countryside and a range of outdoor activities – from horse riding, to golf, to mountain-biking means your stay in Kent will be memorable for all the right reasons. Once you’ve chosen your location, or the type of accommodation you’d like to stay in, browse through our members’ pages to see what Farm Stay Kent can offer you. 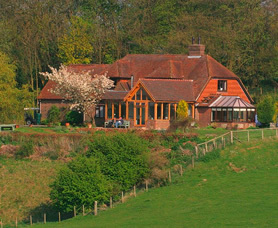 Farmhouse B&Bs offer a real insight into country life. If you stay on a working farm you can experience authentic country life at first hand. You can enjoy hearty cooked breakfasts lovingly prepared from fresh local produce, while easy access to country walks or higher-energy pursuits like mountain biking and horse riding will provide entertainment for all the family. If you prefer the freedom and economy of self-catering we can offer some beautiful, secluded country cottages where you can suit yourself. Leave early to explore further afield or spend lazy days reading by the fireside. Perfect for either family holidays or a romantic getaway, all farm accommodation is self contained and many are close to areas of outstanding natural beauty – making them the perfect base for walking, cycling or bird watching. Glamorous camping, or glamping, is one of the best ways to enjoy the Kent climate and countryside without breaking the bank. And if you’re haunted by childhood memories of damp canvas and burnt sausages, then it’s time to think again. Camping in the 21st Century has all the mod cons and is much more luxurious than you’d think. Our camping venues include a luxury campsite and a quaint camping barn. Both of which allow you to make the most of the outdoor activities Kent has to offer.